HÀ NỘI — Much has been said about women being underrepresented in science and engineering, and measures have been suggested to drive the female presence in the sector, including the importance of role models. Nguyễn Thị Nguyệt, 68, is one outstanding example, representing Việt Nam in 2018 within the ranks of female scientists at the Asia-Pacific Nations Network (APNN), which is part of an international network of women engineers and scientists. After graduating from the Hà Nội University of Science and Technology, Nguyệt started working for Đông Anh Electrical Equipment Corporation, part of the State-owned Việt Nam Electricity (EVN), and dedicated her career to electrical transformers – devices that adjust voltages, up to 500kV and above, from mains electrical lines to levels appropriate to either home appliances (which require only hundreds of volts at best) or to power plants that require hundreds of kV. It’s certainly not a piece of equipment that screams excitement but Nguyệt’s design for 500kV transformers in 2010 – coinciding with the 1,000th anniversary of the establishment of the capital Hà Nội – has put Việt Nam ahead of all other ASEAN nations and made it the 12th country in the world to successfully produce the device. Nguyệt’s achievement has been hailed as a great leap for Việt Nam’s power sector as it has made the country less dependent on imported products, which are costly and might expose vital power supplies to risks of external sabotage. For her service, Nguyệt has received two Government commendations, several science awards and recognition from the World Intellectual Property Organisation (WIPO) for her work on the 500kV transformer. Though excelling in maths and physics, Nguyệt was a soft-spoken woman with avid interests in drawing and poetry, and even her relatives were surprised to learn that she would pursue the engineering path, not exactly a popular career choice for women in the 1970s. Nguyệt persisted through years of work and those difficult post-war periods, driven by her wish for her people to use Vietnamese products. In 1992, she started working on making a 110kv transformer, thinking that if foreign scientists could do it, so could she, even though she had never studied overseas. After two years of research and experiments, she finalised a workable 110kV using Vietnamese technology and crafted a commercially viable production method for the device, which was greatly appreciated by many provinces and cities across the country as production started to ramp up after the introduction đổi mới (renewal) policy. Success didn’t come easily. The anxiety of the first trial run still makes her shiver, because a number of things could have gone wrong and sent her back to the drawing board. “Firefighters were on standby in case anything went wrong. The atmosphere was tense and everyone was waiting with bated breath, while top leaders and technicians discussed whether the system was ready,” Nguyệt said, recalling the first run of the 110kV transformer in Vĩnh Phúc Province. Her 110kV transformer laid the foundation for Việt Nam’s electrical equipment production industry, as it gave it the capacity to make high voltage machinery. Moving on to 2003, she undertook a national research project to produce a 220kV transformer – the main device used in the national power transmission system. Nguyệt said that during her research, there were times she thought about giving up, because it was a lot more difficult than her 110kV device. Engineer Nguyễn Đình Toàn, who was a trusted partner for Nguyệt from the very beginning, said that at the time, most Vietnamese technicians hadn’t seen the configuration for the 220kV transformer, needless to say how much of a tall order it was to make one. “But I had faith. Nguyệt is an excellent engineer. She was brilliant at school, and she possesses great dedication. There were days when she skipped meals and sleep to work,” Toàn said. True to Toàn’s conviction, Nguyệt did eventually prevail and Việt Nam had its first domestically made 220kv transformer, which was 20 per cent cheaper than its imported counterparts and worked just as well. But that wasn’t enough for Nguyệt. She set herself another target of developing a 500kV transformer, which many thought would be impossible at the time because only a handful of advanced countries had achieved the feat. 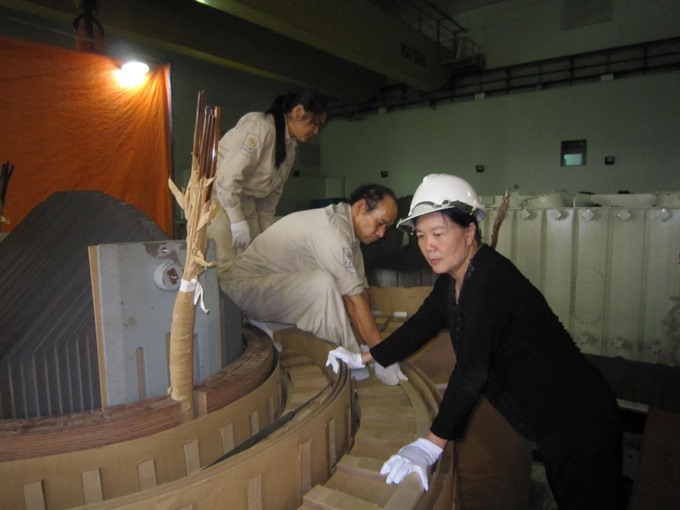 This goal was inspired by her successfully repairing a 500kV transformer at the Yaly Hydropower Plant in the Central Highlands province of Gia Lai in 2005, a task previously tasked for foreign experts. “Undertaking this mission was a huge challenge for me but I had the courage to accept it. When I first presented my initial ideas, Russian experts told me that a single engineer, and a female at that, would not be able to do it, because in their country, it took eight leading professors with support from dozens of technicians,” Nguyệt recalled. “If anything, their words provoked my determination to prove that being a woman or a man doesn’t matter in science. And that I didn’t need to be a professor to make it, as long as I had my knowledge, conscientiousness and passion,” she told Vietnam News Agency. Reality was much harsher than she expected. Countries capable of making the devices naturally, remained highly secretive of their technologies, which meant her research involved a lot of deduction, guesswork and time-consuming trial-and-error. Her prototype was first trialed on a rainy day in Nho Quan District, Ninh Bình Province. “The 200-tonne station trembled and made a lot of noise. I was terrified and thought there may have been a short-circuit somewhere, but I remained confident in my work and thought that maybe someone else had made a mistake somewhere. I tried to keep calm and inspected the wiring, and my hunch turned out to be right. After that, the whole thing went smoothly,” Nguyệt said. The incident revealed the device was working fine because otherwise, disastrous consequences would have happened, she said. During her time working in the electricity field, so fraught with lethal dangers and huge economic losses, Nguyệt was highly-strung a lot of the time, given the demanding attention the job required. Nguyệt said she was grateful for the support of her husband, who she said “always had her back” even when a work-life balance proved impossible at times. She admitted that she wasn’t exactly the typical homemaker that is often enforced upon or expected of Vietnamese women in a society steeped with Confucian traditions and values. While there should be no distinguishing features between men and women in science, female scientists are often dealt a bad hand, Nguyệt said. “In a household, if the husband comes home late from work, the wife has to make sure a meal is ready, the children are cared for and the house is clean. But for me, as a wife, I felt sad that sometimes during busy research periods, I wasn’t able to do that for my family,” she said. She recalled one occasion when she was working on the 110kV transformer and her child fell sick, but she chose to follow the call of duty instead of rushing home. “I told her that I had to go to the factory to manage the installation, and that I would be back home in no time. But the job got me carried me away, and I totally forgot about my sick child waiting at home. I only remembered when we finished the job, and my daughter was running a high fever. I was so worried,” she said. Now in her retirement with plenty of leisure time to spend with her family, Nguyệt still isn’t ready to call it a day yet, saying that she still has so much more to give, especially to inspire the younger generations.